Sajan and Rahman pose in front of a model of Jewelz. 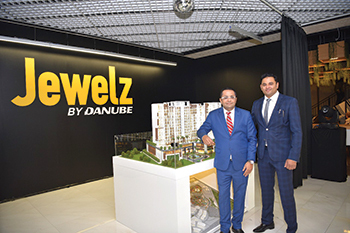 Danube Properties, a leading developer in the UAE, has launched a new Dh300-million ($81.6 million) affordable luxury housing project called Jewelz, offering 463 residential units, ranging from studio, one- and two-bedroom apartments. 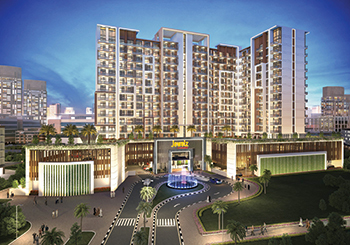 Danube’s 10th project was unveiled by Rizwan Sajan, founder and chairman of the Danube Group, and Atif Rahman, director and partner, Danube Properties Development, in the presence of the media, brokers as well as senior management of the company. The project is located on a plot adjacent to Miracle garden at Arjan with a private entrance leading to the property. The amenities include a fully equipped health club, swimming pool, steam and sauna room, multi-purpose hall, jogging track, barbecue deck, badminton court, paddle tennis court and a high-tech surveillance system. Jewelz ... ‘affordable’ luxury homes. The building’s design and architectural aesthetic are in line with Danube’s design strategy to maximise the living space while delivering convenience of community living. The project dedicates 50 per cent of the space to open areas with an emphasis on greenery and landscapes. Referring to the real estate market, he adds: “Dubai is a lucrative and transparent market when it comes to investment. You will get the highest return on investment, high capital appreciation, and ease in doing business and strong economic growth. Rahman says this latest project takes Danube’s portfolio to Dh3.14 billion, reinforcing its presence in the industry. “I reiterate that as a company we have remained focused on two things ‘what we deliver’ and ‘when we deliver’ with detailed attention to the process more than the result,” he says. “I want to assure everyone that as a builder we go beyond the top line or the margins we make and we are driven by customer satisfaction. There has been continued increase in interest from people looking to invest in affordable homes and we promise to offer the best in the class asset in this segment. “We carefully design our projects to meet end-users’ needs and deliver a community lifestyle, evidence of which can be seen at our recently delivered projects. I also want to highlight that alongside the brand credibility, excellent location and design at extremely competitive prices, Danube Properties empowers its customers by offering a convenient payment plan which helps them build their home,” he adds.